Who here is a fan of grilled meat? Somehow I expect this place to be a bunch of soy patty eating neo-punks, but perhaps I am incorrect. Anyway, I do a lot of grilling in the warmer months, and now that I live in Florida, that means I'll be doing a alot of grilling year round. Some friends of mine and I were going to go all out and build a fire-pit out of bricks in my back yard (which is mostly sand), but it's such a hug endeavor, and you start to get lazy on the weekends when your backyard is made mostly of sand. So I'm looking to pick up a good grill. The charcoal kind. I'm probably going to get a gas grill too, but that's less important, because when I really care about it I'll be using charcoal anyway. There was a large, cylinder shaped "Char-Broil" grill at home depot that had a smoker attached to the side. It looked interesting. I just gave up my Weber kettle (charcoal) grille to my parents. So far, my mom says everything tastes like lighter fluid. Weber is considered a good brand, but I don't have enough knowledge about these things to recommend a combo gas/coal grille. PS: Cook veggies on your grille too. They're great! You just have to kabob them or get those little cage thingies. But nothing beats a medium-rare tenderloin over charcoal. Mmm-Mmmmmm! Get yourself a Char-Griller (I have the super-pro, but now it's essentially the smoker-pro since I added a firebox). Do NOT get one of those dinky little ones. You cannot grill properly on them. If possible, get one with a firebox so you can cook indirectly and use the main grill body as a smoker (my ribs take 3 hours to cook). As for the char-broil: take a look at how much room you have when it's open. I think I know the one you're talking about, and the problem I have with it is that when the smoker body is open, you have a limited range inside to move things around. I'm sure it'd be fine, and I have friends who use that grill, but one of the things I like about my char-griller is how much room I have when it's open. Once you get it, I can give you some grilling tips on how to use it and where to get good spices/make good spices (for dry rubs) if you're interested. Ignore midwinter. He's talking through his arse. Repeat after me. A big one. They are the way to go. Used correctly your food will not taste like lighter fluid. Maybe - and it's a big MAYBE - I'll post the recipe for Green Slime later. Sounds awful. Makes any meat taste divine.....especially when cooked in a Weber! as for lighter fluid: don't use it. 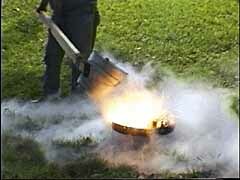 Get you one of these and use it to start the coals. Works like a top. And ignore crazychester. She's, um, crazy, and will likely catch you in a fog. Watch it buster or I'll set Jack my dog onto you. Hey wait a minute, Chester! You know I'm a peaceful man! Any large enough grill will do the job, and I've had luck using the smaller ones (with lids) for corn-on-the-cob and potatoes. I have to second the recommendation to use one of those towers instead of lighter fluid. Rub the steak down in oil, garlic and black pepper and it'll cook up nice and juicy. If you're using barbeque sauce, add a little orange juice concentrate and fresh onions. If there are any Amish nearby, get your meat from them. If not, well, you'll just have to subsist on the commercial stuff. You know, I've cooked some steaks that way, and I didn't care for them all that much. I usually just use worchestershire (lea & perrins), crack pepper, and Tony's. Heh. I cooked some ribs for a friend a few weeks ago (dry rub) and she said "You know, I've always had sauce on ribs. But this dry rub! What a novel concept! Make the meat taste good!" No kidding. A local butcher will have better meat than the supermarket, too. I don't use lighter fluid. I have a cylinder with holes in it. You fill the bottom with newspaper and put coals in the top. light the bottom, wait 15 mins. When I do need a kick, I use 91% isopropanol. You can get it at any drug store, super market, or walmart. cheaper than lighter fluid, less dangerous, and no smell. does just about as good for lighting coals too. As far as meat is concerned, there were better options in New Jersey than there are in Florida, including the rare visit to Peter Luger's. (serious cardiac arrest). But if you search, you can find good meat. Melbourne is like one big tasteless sprawl, and it can be hard to find anything of finer quality. (When you spend your whole life in DC and the northeast corridor, you get spoiled). Fortunately, there's a store that sell free range meat. very good stuff. Well, to be frank, I usually just rinse off the steak and throw it on the grill, but I pulled out the fancier stuff since that seems to be the way most people enjoy meat. I like the oil, though, because it seals in the juices, and that's one of the best parts of a good steak IMO. I don't grill ribs much, but I'll try that. Thanks. You can sear the steak (put it on a HOT grill for about 30 seconds a side) first, and it'll accomplish the same thing. Sorry for going on about ribs so much. I'm getting ready to cook them tonight, so I guess I've got them on the brain. Well in that case, I guess I better feed you while I can. So, without further ado, I present to you all the secret recipe for Green Slime courtesy of my sister's one-legged partner, Evan, an exceptionally good cook. You should consider yourselves extremely lucky to have this culinary delight bestowed upon you. The following describes the best way to use Green Slime on a leg of lamb but it makes any meat including chook taste great. Very nice on spare ribs too. Then spread it over your lamb's leg in which you have inserted lots of little bits of garlic, lemon rind, and rosemary. Sprinkle this with crushed almonds or such. You really don't need all that last bit, the almonds etc. It does require some effort to get to the slime stage unless you use a food processor or a hand held mixer (one of the strong metal ones - a Bamix is ideal if you know what that is). An hour or two before hand, you will have lit the charcoal heat beads with fire lighters in your lovely WEBER so it's all ready to go. Cook the Green Slime smeared meat for the appropriate time. Enjoy! Check out Barbecue News There is a place for types of grills and better solutions to starting your grill, that Super Cedar is frickin' marvelous! Anyway, they are a good reference! One other thing: when you get your grill, you'll want to cure it. Usually you can just cook something really greasy like chicken as your first meal and it'll do the trick. Too bad there are no ukrainian/polish butchers around here. You use the whole rind from your citrus?!? Not just the zest?? Just love grilled meat ! this one we just bought here in Curacao. I copied Evan's rendering of the recipe verbatim. But I'm sure he means just the zest not the whole rind. As I suspect you already know from the above post, the pith (I think that's what the white stuff's called) is bitter.